It was on the 2nd of February 1968 at the world-famous Marquee Club in Wardour Street that Jethro Tull first performed under that name. The group would go on to become one of the most successful and enduring bands of their era, selling over 60 million albums worldwide. The debut album, 'This Was', was released later that same year. Founder, frontman and flautist, Ian Anderson, is rightly credited with introducing the flute to Rock as a front-line instrument...not to mention the codpiece! Tull are one of the biggest selling Progressive Rock artists of all time and their immense and diverse catalogue of work encompasses Folk, Blues, Classical and Heavy Rock. The anniversary concerts will feature a broad mix of material, some of it focussing on the earlier formative period through to the "heavy hitters" of the Tull catalogue from the albums 'This Was', 'Stand Up', 'Benefit', 'Aqualung', 'Thick As A Brick', 'Too Old To Rock And Roll: Too Young To Die', 'Songs From The Wood', 'Heavy Horses', 'Crest Of A Knave' and even a touch of 'TAAB2' from 2012. 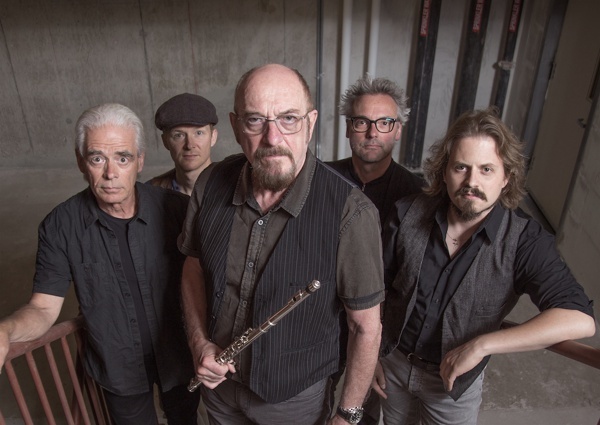 To celebrate this golden anniversary, Ian Anderson will present 50 years of Jethro Tull in eight UK concerts during April 2018 as part of his worldwide touring schedule. 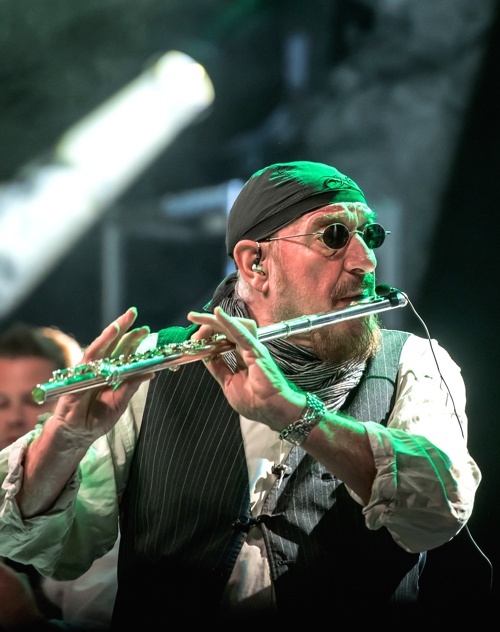 Taking some time out of his busy schedule, we catch up with a busy Ian Anderson who reveals living tales from the past and his future plans. Jethro Tull played their first gig at The Marquee Club in 1968. What are your memories, if any, of that show? It was actually the fourth time we had played there, albeit under other names in the weeks before. So we knew the venue, the manager and the importance of doing well there to try to build a following as a stepping stone to other cities, other venues. Who inspired you to take up the flute? It's both a unique and unusual instrument to play in a rock band. Eric Clapton, in a roundabout way. I was a guitar player in 1967 but realised I would never be as good as Clapton so looked around for another instrument - preferably one that he and the many other great guitarists of the time couldn't play. Better a big fish in a small pool than the other way around. You have adopted a few 'personas' over the years: The Tramp/Aqualung, The Codpiece wearing Bard and The Rural Hunting Sports type, to name a few. What effect does visual theatrics have in your writing process when 'shaping up' an album/tour? Not too much at the time. Better to come up with the music first and only then worry about how to present it, otherewise it could become a little overly theatrical. What are your personal favourite Tull albums and songs that you especially like to play on tour? Probably pretty much the same favourites as most of the fans. There are some 300 songs to choose from in theory but maybe 100 in practice. My own favourites come and go and I keep rediscovering material from earlier albums which capture my attention and my heart. At least for a while. There have been many talented musicians that have played their part in Tull over the years. Can we expect any 'special appearances' on this 50th-anniversary tour? Will you be introducing any songs into the set that you rarely play and still resonate with our times? 'Looking For Eden' or 'Made In England', for example? Well, they are from a 1983 solo album called 'Walk Into Light' so it would not be appropriate perhaps. But there are a few I intend to play next year which are from the earliest Jethro Tull works, some of which may or may not have a contemporary content. Having mastered a diverse range of musical styles: Blues, Folk, Classical, Heavy Rock and Prog, which styles challenges you the most? They all challenge in their different ways: technically, musically, emotionally etc. But I find it quite easy to write music today. The lyrics are always most demanding so I have learned to tackle the words early on and not leave them to later. I found out that that is a bad idea. My personal favourite Tull albums - I like all of them, in their own way - are the trifecta of 'Songs From The Wood', 'Heavy Horses' and 'Stormwatch'. 'Broadsword', too. What inspired you to develop the overall theme on these albums in which to write the songs? Three of those four have album title track songs, so that rather directed the course of the rest of the album styling. I usually find that I have a bee buzzing in my bonnet at the time so the direction follows that general idea when I write most of the songs. The others, I have to bend into shape. That has tended to be the case from 1970 onwards. Looking back over your long, varied and very successful career, you seemed to write songs for albums very quickly. Do you find the inspiration for the writing process comes naturally to you? I am not really a believer in inspiration. I adopt the notion that you have to go looking for it rather than wait to be visited by the muse. After a fruitless hour or two, something usually comes along. As I get older, the process has speeded up a bit, which is good. I had assumed that it would get harder but the reverse is the case. I definitely find it easier these days to write songs, but not necessarily easier to write good ones! You must have so many memories from the past fifty years of recording and touring. Anything that stands out that you can share? But the memories of things happening to me, whether fun or downright embarrassing are never a problem to talk about. Being struck during a show by a used tampon on my bared chest or having a pint of pee poured over me as I walked out to the stage in Shea Stadium come to mind. Rather brings a man down to earth, wouldn't you say? Is there a chance of newly recorded music to be released to celebrate the 50th anniversary? I have actually postponed the new studio album to early 2019 to avoid the plethora of re-releases, box sets and live stuff coming out during 2018. I think that next year, uncharacteristically for me, should be a year of looking back and celebrating past times and repertoire rather than unleashing unfamiliar new material on a nostalgic fan-base. We have already recorded half of the songs for the next studio album, which I wrote last January. It is frustrating to leave it for a while but probably best. I just have to hope that no one else comes up with the same title or concept during the next 18 months. Otherwise, back to the drawing board! Pre-sale Tickets available on 30th August: http://www.gigantic.com/jethro-tull-tickets-presale-1051 and venue box offices. Tickets are subject to booking fee. There is no support - please see ticket for start time.